The chapter officers are group of volunteers elected to conduct the business of the organization including, but not limited to its financial affairs, planning and implementation of actions on behalf of PFLAG- SGV API Chapter, and oversight on all projects. Marsha is an author, speaker, educator and advocate for the LGBT community. She serves on the PFLAG National Board of Directors and co-chairs PFLAG’s Diversity and Inclusion Committee. Marsha is author of Two Spirits, One Heart, a memoir that chronicles her journey from fear, shame and sadness to unconditional love and acceptance as she navigated the transition of her son from female to male. In 2018, Marsha was appointed to former Vice President Biden’s Foundation as a member of his LGBTQ Advisory Council. Janet is a Japanese-Irish-American mom of a young transgender daughter. She has been with Toyota Motor Sales for the past 19 years and is the founder of the API LGBTQ Dream Team Giving Circle (that raises funds to supply monetary grants to non-profit organizations that are providing education, resources and support for API LGBTQ individuals and their families). Sung was born in South Korea and immigrated to the US when she was 7 years old. Although she was sheltered in her conservative Christian bubble for 30+ years, when her younger child came out as transgender, she knew God had a purpose for her and her family. Rather than her faith in God being shaken, her journey of initial confusion evolved and she has become a vocal and visible advocate and ally, affirming and loving LGBTQ people, especially those of Korean descent. Her journey has made her more compassionate to the amazing people who drew her out of her comfort zone. Born and raised in Hong Kong, Anna Chu received undergraduate and graduate education in New York City. She worked as an Information Technology professional in financial companies in NY and NJ. Anna speaks fluent Cantonese and some Putonghua / Mandarin. On weekends, Anna volunteered as Admin Support and a Kindergarten teacher at a Chinese Language School in NJ, and authored text books for her classes. Upon retirement, she moved to CA where she started volunteering at PFLAG SGV API. 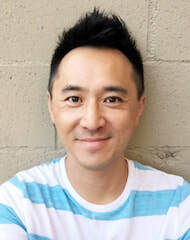 Barney Cheng is a Taiwanese-American writer-director-producer-actor and an advocate for LGBTQ and Asian-American visibility and representation. His landed on the Hollywood map as an actor with his acclaimed performance in Woody Allen's Hollywood Ending. The New York Times described Barney's comedic timing as "surgically precise." The Orange County Register raved that Barney "steals every scene he's in." ​It is the Board's responsibility for the overall policy and direction of the Chapter. Each member may or may not have a role in the Chapter's ongoing activities. Board members are also an all-volunteer group. Amy was born in Taiwan and grew up in the San Gabriel Valley. She currently works in the financial industry. She is raising two children with her wife, Kelly Chen, who is an employment/civil rights lawyer. Wai was born in Hong Kong and immigrated to the US when he was 2 years old. He is the spouse of Sung Tse and has come to realize how important and uncommon it is for fathers be vocal and visible in support of their LGBTQ kids. He is becoming more active and visible as an example to other supportive fathers as well as to affirm and support LGBTQ people. John is Korean-American parent of a daughter and a gay son. John refers to himself as "PFLAG addicts"; meaning that, outside of grandparenting, his life revolves around attending SGV API PFLAG and Long Beach PFLAG meetings. John coordinates and facilitates the Korean Afternoon Tea. Born and raised in the San Gabriel Valley, Alan is second generation Chinese-American. He is proud to have grown in the first and only Asian-American majority assembly district in California. Alan's parents are both from Hong Kong. With a fervor for civic engagement, Alan volunteers also with API Equality LA and many other LGBT activist organizations. Alan is a California State Polytechnic University, Pomona alumni with a B.S. in Computer Information Systems. He understands conversational Cantonese. "My parents are originally from Hong Kong, making me a first generation American and a second generation immigrant. Although I don't plan on being a politician, I think it's important for all Americans to be actively involved in their communities." Harold is a 3rd generation Japanese-American, born and raised on Maui, Hawaii. He and his wife Ellen have been married for 52 years, with a daughter, two sons and four grandchildren. Harold is a retired engineer, and Ellen is a retired teacher. Their daughter came out as gay in 1988. They joined the Los Angeles Parents, Families and Friends of Lesbians and Gays organization (PFLAG) in 1990. They have spoken to college and high school groups, churches, and at various conferences. They are members of the First Congregational Church of Long Beach and belong to other progressive Christian organizations. They are also members of API Equality Los Angeles, and the San Fernando Valley Japanese American Citizens League (JACL). In 2012, they were among the founding members of the San Gabriel Valley API PFLAG chapter. They march in the Los Angeles Gay Pride parade and the Chinese New Years parade, and march with their church in the Long Beach Pride Parade. Harold and Ellen are in two video documentaries: “In God’s House: Asian American Gay and Lesbian Families in the Church,” and ”Anyone and Everyone,” which continues to be shown on PBS stations during fundraising seasons and is now available on youtube.